Like everything these days, you have to make sure you keep up to speed, keep fit and keep producing the goods – and life in an integrated marketing agency is no different. In 1987, an episode of Record Breakers changed Dominic O’Brien’s life, forever. 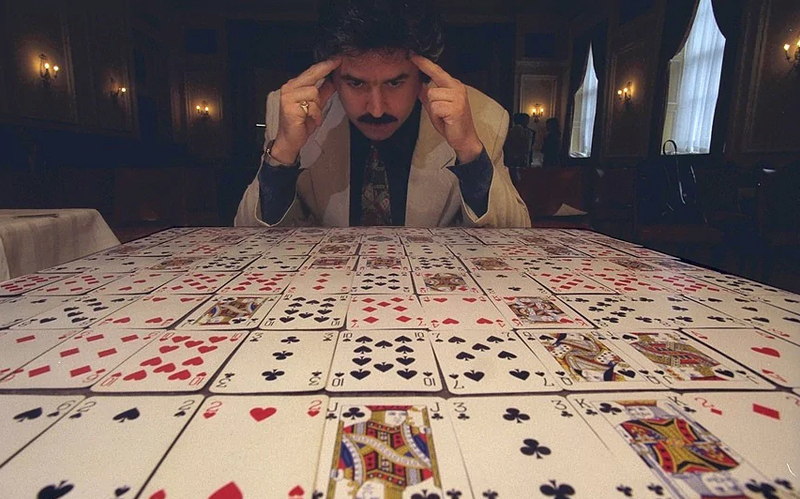 He sat spellbound as a fella called Creighton Carvello recalled the order of a shuffled deck of playing cards, exactly – in under three minutes. Inspired instantly, Dominic thought, I’m training my brain to do that. Now, he has quite the memory. For example, by looking at each card just once, he can recall a sequence–not of 54 playing cards, but of 54 decks of cards, shuffled randomly. Dominic won the World Memory Championships eight times between 1991 and 2001. Since then, he’s made a living out of his memory and has worked with a number of high-profile people, including Lenny Henry. Before a big tour, Dominic trains the funny man to remember his material before taking the stage. And, through practising different techniques, he helped Henry remember long Shakespearian speeches whilst playing Othello. No one has won the World Memory Championships more times than Dominic. His memory is so revered, he’s banned from Las Vegas’s casinos. But what makes this more amazing is that Dominic O’Brien is no genius. He wasn’t even a star pupil in class and as a student, had problems reading and writing, eventually being diagnosed with dyslexia. He’s the first to admit his brain is average. He’ll also tell you that you can achieve similar results. Yes, you. Because the human brain is a muscle. And like every muscle, it thrives on regular and varied use. So for anyone in a creative role such as copywriting, art direction or the creation of advertising concepts, this is like gold dust. One: you don’t have to be born with innate creativity. Two: you can improve on the creative prowess you already have. As someone who regularly electrocuted myself in years of being a bad electronic engineer before deciding to become a copywriter, I’ve always thought you can train your brain to become more creative. And because I earn my living from generating ideas in an integrated marketing agency, I don’t stop training my brain. But how can you train your brain to more creative? Get what? A cruciverbalist is someone who solves crossword puzzles. And a quick crossword every now and then will work wonders for giving your vocabulary a boost. But, as many marketing and advertising routes are based on two ideas or thoughts mashed together, cryptic crosswords are even better and an amazing way to physically make your mind focus on two or more things at once. And … bonus … as Ann Luktis in September’s issue of the International Journal of Geriatric Psychiatry points out, a daily dose of crosswords can, ‘improve mental functions in patients with brain damage or early dementia.’ Use it, don’t lose it. Why wait for a brief, when you can just go and make your own up? Advertise high-end watches, baked beans, gold-plated paper clips–anything. Whilst ploughing through my graphics course at uni, we had about a month to work on one brief, which left a lot of time to create self-initiated projects. Do it even if you’re a professional, because it’s a great way of making yourself produce ideas and letting your mind have a serious play out without brand restrictions, caveats… and editors. Can’t think of a brief? There’s a great twitter account called, @OneMinuteBriefs which will set you one every day of the working week. It’s a very inclusive network of student creatives, professional ad people and those who just love the sport of creating. It’s also very supportive and, if you ask for it, you’ll get handy crits, advice and suggestions. You also get to see loads of others’ ideas on the same brief, which works wonders to help your brain veer off your own beaten track. Look at existing ads. It doesn’t matter what kind; press, TV, even radio ads when you’re in the car. Take the ad and then work out what you think the original proposition was. Mull it over in your mind and ask yourself what kind of proposition is it? Price-led? Service-beater? Convenience? Then think about whether it’s a rational proposition or maybe an emotive proposition. Does it bang on about features or does it hammer home the benefits or, if it’s any good, the one, single-minded benefit? You may come up with more the one answer, but it doesn’t matter. You’re forcing your brain to think about the mechanics and indeed, the art of the ad–and remember, you’re exercising here, not solving one specific problem. What? That’s right, some of the best cartoon strips are a great way to make your brain think about two or more concepts at the same time. I’m thinking of stuff like Calvin & Hobbs, in which the genius author, Bill Waterson lets us into the world of a young boy and the adventures he has with his stuffed tiger. 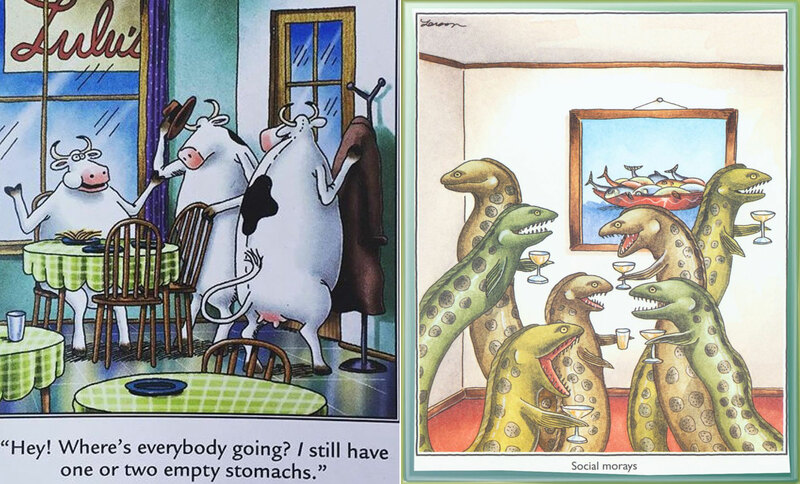 Even better for twisting your brain into shapes it may not normally venture is Gary Larson’s brilliant Far Side, in which we’re treated to thousands of random universes where animals and insects make you view your own world differently. And this is the key; the more exposure you can give your brain to different ways of thinking, the more it will tune in to different ways of working. Combining abstract with reality. Dramatising benefits in hundreds of different ways. Packing more into propositions. And of course, manipulating insights to be far more impactful. Ok, I’ve mentioned physically changing the way your brain’s synapses fire off, but this point is about old school exercise. For me, running and swimming – solitary exercises in my case, are the perfect way to do two things: 1 – brew half an idea or no idea at all into a full blown campaign and 2 – switch off altogether from the stress of trying to meet a deadline with an idea. Which in turn, resets your brain and can often generate an idea from a different spot. How? I’m not entirely sure. But I liken it to being stuck down a tight alley in a car with no reverse gear that no matter how many turns you do, you can’t get out. The physical act of getting endorphins going, picks that car up and sticks it on an open road, ready to start again. Humans love to laugh with each other. And humour has always been a big part of advertising – not just for recall, but also to create empathy between us. But not only that, in much the same way as the more abstract cartoon strips help your brain to view life differently, jokes can split your mind and send your thought process down two different paths at once. Watch more comedians – those who tell long story-type jokes will not only stretch your brain, but offer little slices of human insight you can use to pepper your creative thinking. Go see more stand-ups, get out to a few open mics – if nothing else, they’ll relax your mind so much, it may open the door to a creative nugget you’ve been trying to crack all week. Because, as the whole point of this piece states, your brain is a muscle which benefits greatly from exercise. And like every other muscle in your body, it appreciates a little rest now and then, too. As a footnote, after a ten year break from competition, Dominic O’Brien, at 60 years old, has this month, just won the World Memory Championships Senior title. Just shows what giving your brain a workout can do. And as we marketing agency types always say, you never, ever, stop training.